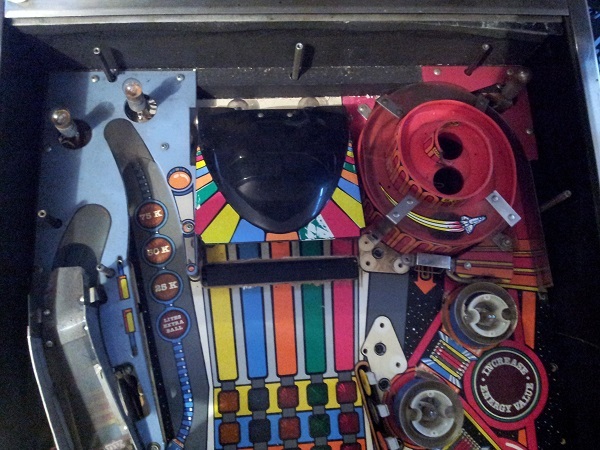 An area of the playfield I’ve been looking forward to working on is the mini playfield and the pop bumpers that live beneath it. I’ll also take the opportunity here to look at the bank of 5 stationary targets that sit just to the left of the pop bumpers. It’s going to be a long update I think and lots of photos to look through. So hopefully you hang in until the end 🙂 The starting point is good. All plastics and posts are there. 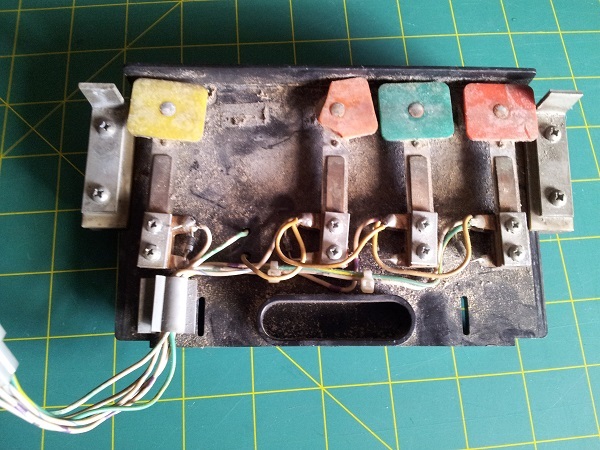 The mini playfield itself is in one piece, although I can see some small cracks at a few point that will need to be looked at. I’m really starting to run out of things to do with rebuilding the playfield. The flippers are waiting patiently, but this update will cover the motor which drives the target bank and visor. Truth be told I have put this off. Not sure why exactly, but now is the time. I need to remove the motor, clean it up and also survey any damage to the target bank. To start with though, let’s look at that motor. 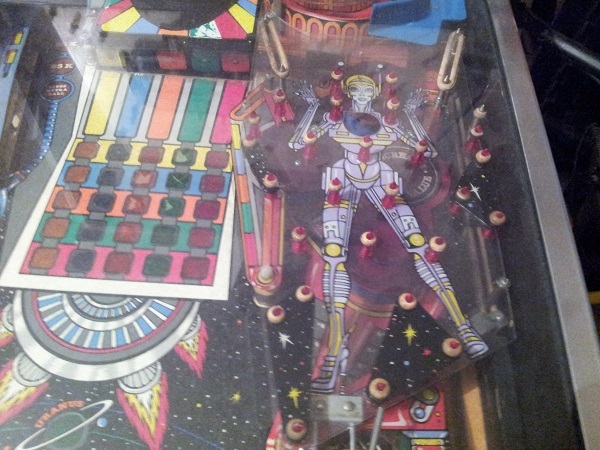 It’s in working condition, raising and lowering the playfield when required by the game. So that’s a good start. A quick inspection shows a few bits of blue tape in the area which will need to be looked at (as in – why are they there). Otherwise it just needs a solid clean. I have noticed that the target bank tends to tip to one side while being raised, but I suspect that’s more to do with the target bank assembly itself than the motor. Something that didn’t quite make it into my update last night was looking at an issue with the drop targets. I rebuilt them recently, but noticed a problem once complete. 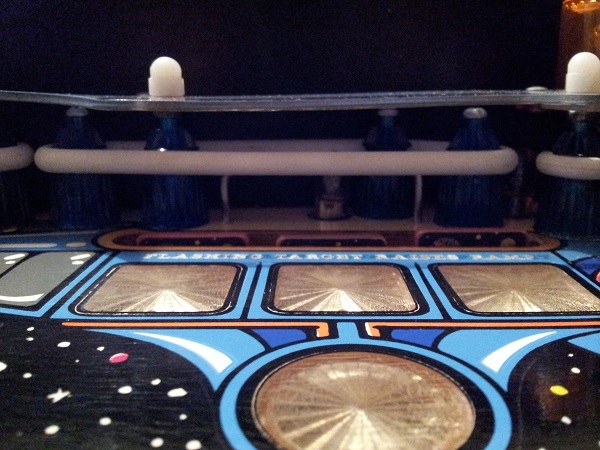 The targets sit a bit too high when they retract, which causes them to sit over the top of the playfield. This causes the ball to jump when hitting them – especially on the right target. Not good for the life of the drop target, and puts the plastic above it at risk of damage. Now it’s time to look at the visor. I’ve successfully managed to put this off for awhile, but I’m fast running out of things to do before I get to the restenciling of the cabinet and playfield swap. So I guess now is the time to look at it. At first glance, the only obvious issue is the damage to the colour stripe decal. The motor is operational and will raise or lower the target bank. It seems to get slightly stuck along the way, but does correct itself – so that will be something to look at. There are also two eject holes I will need to rebuild. I’ve decided to split this update into two. 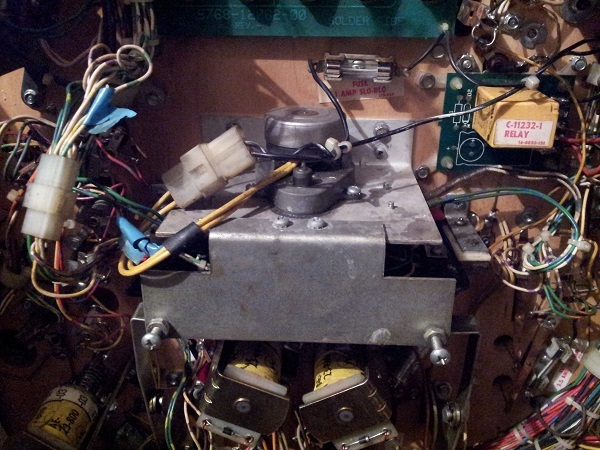 The first will focus on the playfield and parts. The second (which I’ll post once complete) will cover the motor and target bank.